What are the most pressing problems facing new parents today? As the world has become increasingly more complicated, so has parenting. We are concerned about pervasive toxins in the environment and anxious to raise our children in ways that will protect them as well as safeguard our fragile world. Manda Aufochs Gillespie, The Green Mama, shares what today’s science and Grandma’s traditional wisdom tells us about prenatal care for mothers-to-be, breastfeeding, detoxifying the nursery, diapering, caring for baby’s skin, feeding family, and healthy play—redefining the “basics” of parenting for today’s world. 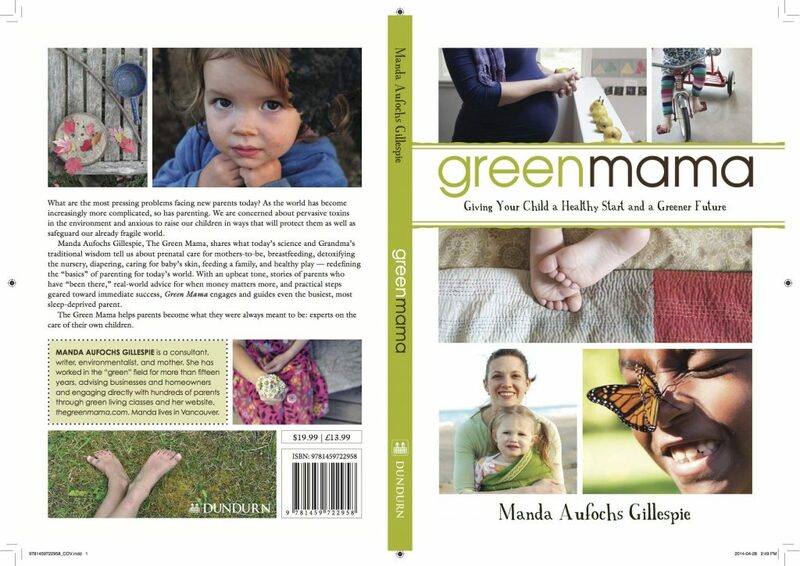 With an upbeat tone, stories of parents that have “been there,” real-world advice for when money matters more, and practical steps geared toward immediate success, Green Mama engages and guides even the busiest, most sleep-deprived parent. “Manda Gillespie is present at the creation! Motherhood is the most enduring form of love and in the act competent mothering, a new world can be brought into being. Written from the heart, this eloquent and beautiful book deserves a very large readership.” —David W. Orr, Oberlin College, author of Hope is an Imperative. “Growing and nurturing a mind, body and soul sends many new parents on a quest for the “greenest” and healthiest choices for their family — as it should. Thank goodness for this book! Manda Aufochs Gillespie takes you beyond child-proofing and demystifies cloth diapering, lists non-toxic nursery must-haves and shares tips to encourage freeplay. A greener future for your little one is inevitable.” David Suzuki Foundation, 2014 Finding Solutions newsletter. In Canada, the book is available at your favourite local bookseller, some green baby stores, Shoppers, Ober Waite’s, and in-store and online at Chapters/Indigo, Amazon, Banyen Books & Sound. In the U.K., the book is available on Amazon and my Aunt-in-law saw it in Ireland. The book has also been released in India, Indonesia, and Turkey. And now the Green Mama-to-Be is available to help you have a healthy, happy, and toxin-free pregnancy. Reviews really help, and you can write one! They are most needed on Chapters, Amazon, and GoodReads. You can also talk about it on Facebook, Twitter, LinkedIn, Pinterest, or social media of your choice.